A few weeks back in our Foodie Friday post I wrote a recipe for our homemade Granola. I also listed all the things you could do with it. Making energy balls was one of those. So here ( after a few requests 😄) is our recipe for Energy Balls. Now these are something that don't last very long in our house. I understand there are lots and lots of variations of these. This is just the one that works well in our house. A practical Paleo house. 1) In a blender throw the granola and dates and blend until you get a sticky breadcrumb texture. 2) Add the coconut oil and desiccated coconut and blend again quickly. Your mixture should still be a sticky breadcrumb texture. 3) Start to melt the dark chocolate in a bowl over boiling water. 4) Using a tablespoon start scooping up and rolling and pressing your mixture into small sphere shapes. And when they are all made place in the freezer for 5 min. 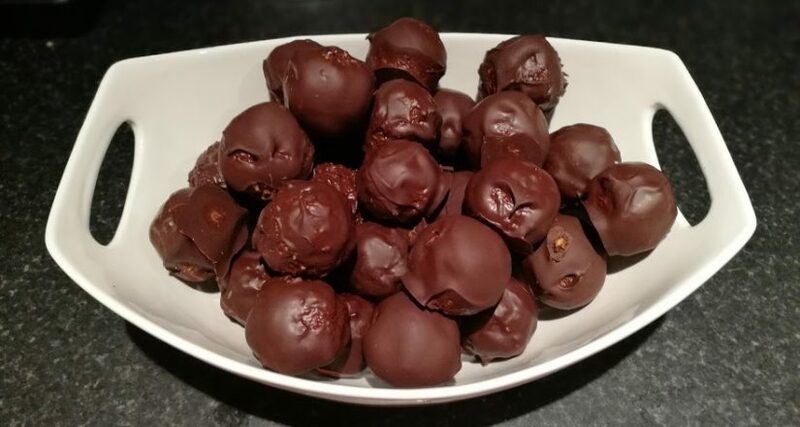 5) One at a time dip the the energy balls into the chocolate mixture and place on parchment to harden. 6) Store in the fridge. These are a great snack and only a tiny bit bold. Great with a cup of tea or coffee. Or given to the kids they think they're getting a chocolate treat.